Felix.......well.......Felix is in my heart and my soul. He found me, he needed someone to help him, he was desperate and clever enough to search for me. Just so amazing and mind boggling that he suddenly appeared out of nowhere and sat right next to me on the bench. The next day we found a local veterinary practice and bought Frontline and Drontal and ear cleaner! Felix had really dirty ears and so he was wormed, flea'd and ears sorted! Good job Jane, just like being at home. He was so gentle with me doing all this to him although he did grumble a little but he knew I was helping him and the scratching would stop and he could eat his food and not the worms eating his food inside him and finally he had full hearing because his ears were clean! All of that holiday, he never left my side, we became best friends. I could feel the need in him, I just wished that I could get him home to the UK. We're back in Crete! Different flight times meant we landed at night, straight to the villa and hunt for Felix, please God let him be alive. Nothing......I called for him all night, I couldn't bear it. Stayed out till midnight even though tired from our flight, just nothing. Next day, our first day of the holiday, stayed at the villa, ventured out just for shopping. No sign of Felix at all. Walked around the whole seven acres of the plot, felt awful. 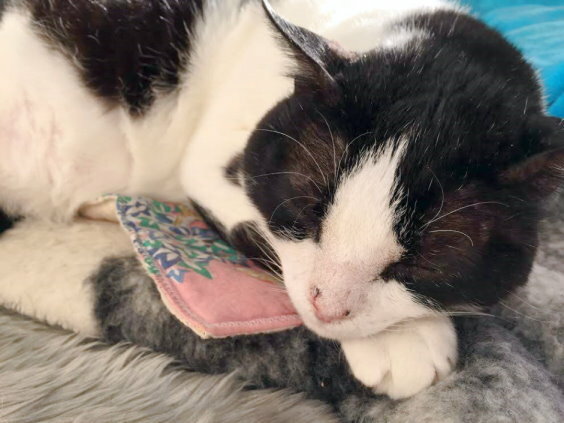 Night time came, put cat food out, wetmeat and biscuits, thinly sliced ham too, half hour later I went back to the bowls of food just outside our french doors, I stood over the bowls looking at them feeling very tearful..........then!........a faint cry! Oh my God, he's here! "Felix is here" I shouted to Paul. Felix came right up to the bowls and started noshing away at the food with a frurry, he was absolutely starving, so thin, he had seconds and started to slow down with his eating. He polished everything off, I watched him with such happiness in my heart.......and relief, he's alive, so grateful, so very grateful. If there is a higher being in the clouds, well, I thanked them several times over and promised to always do my utmost to help any cat and kitten I could. Back to the vets for Frontline and Drontal. We stayed for a month and Felix was my shadow, my companion, my friend, my soul. Again, that dreadful time came........we had to leave, the only thing was we had made friends with a wonderful couple who lived on the island and they did cat rescue. Paul and I had been helping them when and where we could. I knew how stretched they were in every direction with the connotations of what rescuing cats and dealing with the public and vets brings, not to mention financial straits involved! So sad to say nothing could be done at that time to bring my Felix home. A few months went by and we returned to Crete. 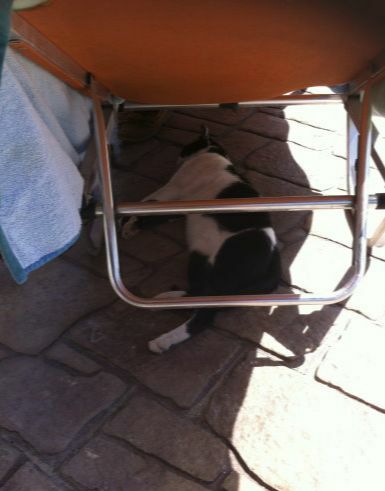 Felix was there at the villa; thin again, his nose was a mess, looked bitten and scratched and sore. I treated him for flea's and worms, this time bringing vet products from home! Weird when packing my suitcase to come to Crete as 'normal' people have towels, swimming costumes, clothes in theirs, well I had the same but with the addition of cat meds, I did think, I hope I don't get searched in the airport, try explaining "well yes! I can assure you they are cat drugs!" to the officer in front of me, luckily that never happened. We were back for a month again, so in the beginning I asked my close friend to help, if she could find Felix a flight or a space with a van man, she said that flights were few and far between at the moment and there was not a van man in sight! No trips pending. Anyway, I thought well we have a month, let's pray for a miracle. I got Felix neutered and micro-chipped so that was two things less to worry about and he would have had to be neutered and chipped anyway to travel. Five days from the end of the month, yes five days.......Paul and I are sat outside at the villa and I had Felix on my knee, I was close to tears at the thought of leaving him again, I couldn't, just couldn't.......I watched him sleep on my lap, so happy to be with me, fed, warm and loved, he didn't know his life was to revert back to being bad and soon! The phone rang, "Hello? I said". It was my friend, she said "I've got a flight for Felix, now it's expensive" I interrupted her "book it! book it! oh it doesn't matter how much, oh thank you, I can't tell you how much this means to me". Tears duly arrived, dripping onto Felix which made him meow in his sleep. If only you knew Felix, you'll never ever ever be hungry and lonely again, you are coming home! I will never forget how my friend helped me in my desperate time, I must say I normally help other people with cat situations, so this was a new one on me, you know, to actually need someone's help, which is why I will always help The Cats Pyjamas Rescue whenever and wherever I can by sending crates full of food and meds and carriers and litter trays with the help of the lovely volunteers of my shelter, Woodland Nook. I will never forget what she did for me that day and for Felix, of course! Felix arrived at Gatwick, Paul and I went down to fetch him, it was raining hard, I hardly noticed, so excited to be re-united with Felix again. This was two years ago, Felix resides in Woodland Nook, he loves being in the shelter, he is grandad to all the kittens, he grooms them and tells them off when they are naughty. He is quite chunky shall we say but he is still in the mindset that each meal may be his last. He is mine and can come into the house when he is good and ready; at the moment through he is so content at being in the shelter with the others. 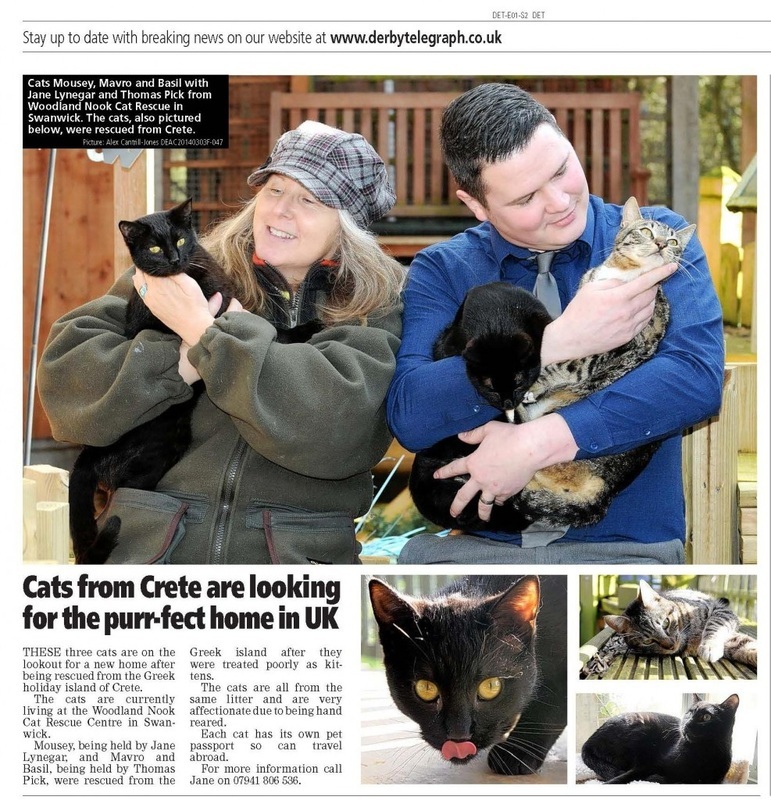 ﻿Here at Woodland Nook, we have developed a partnership with a rescue centre in Crete, The Cats Pyjamas Rescue. Kittens and cats are abandoned throughout Greece and its many islands and in recognising this problem we work together to bring Cretan cats to Woodland Nook and find their Forever Homes. Here we have our current babies that need homes. Our mission is to rehabilitate and re-home abused and abandoned kittens and cats. Our babies are always searching for their Forever Homes and that is where YOU come in. If you are interested in adopting a Cretan cat then you can contact Woodland Nook by calling the mobile number above. Alternatively, you can email or contact us via our Facebook Group. Should you decide on adopting a kitten or cat from us then we will carry out a pre-home check. We ask for a £20 reservation fee (non refundable deposit) plus a minimum donation of £55 per kitten or cat as this helps to maintain our privately run shelter. Interested?﻿ Please take a look at our many current kittens and cats. TWO KITTENS: THE BENEFITS OF ADOPTING IN PAIRS . . .